Sue VanHattum has assembled a marvelously useful and inspiring book. It is filled with stories by people who don't just love math, they share that love with others through innovative math activities. Playing With Math is perfect for anyone eager to make math absorbing, entertaining, and fun. Our crowd-funding campaign is at incited.org. Check us out! 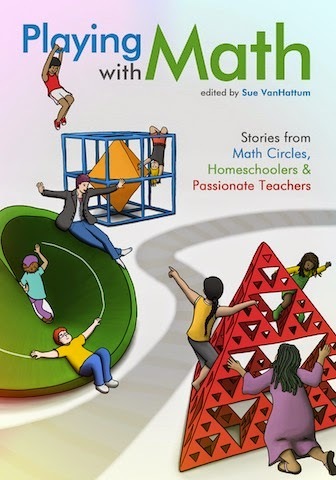 Playing With Math: Stories from Math Circles, Homeschoolers, and Passionate Teachers has over 30 authors, who each tell their delightful stories of sharing their enthusiasm for math with others. Over the past 5 1/2 years I've been compiling and editing the chapters with love and care, creating this amazing 328-page book. It's ready to head to the printers now, and can soon be in your hands. Whether you enjoy math and want materials that will help you share some math-love with your kids, or you fear and loathe math and need help getting over that hurdle so you won’t pass it on, Playing With Math will give you inspiration and lots of new ideas. Today is the first day of our crowd-funding campaign. For a contribution of $25, we’ll send you a book as soon as it’s printed. In case the idea of crowd-funding is new to you, here’s how it works: You can contribute anything from $1 to $5000 (with rewards at each contribution level) to help us pay for our illustrators, editors, page layout person, and printing. This is our way of asking for community support for this book as part of the production process. We hope to build lots of energy around the ideas in the book through this campaign. You can see more details at incited.org. Besides contributing, here’s another way you can help. Think of five friends who would enjoy this book. Do you have friends who get frustrated helping their kids with math homework, or teach young kids but don’t feel real comfortable with math themselves? Do you have friends who enjoy math, and want more materials to share with the kids in their lives? Do you know someone who might want to start a math circle? Can you send this appeal along to them? Go to incited.org and contribute. (A $25 contribution gets you a book.) If you do it right now, you won’t forget. Email five friends who might like to read Playing With Math: Stories from Math Circles, Homeschoolers, and Passionate Teachers, and ask them to read this. Mathematics is a creative activity, like music. It requires some technique, and the technique has to be taught, but the main point is elsewhere - it is all about creativity, a sense of enjoyment, and higher purpose. This book goes a long way in that direction. The Internet is presently bursting with vibrant writing about mathematics learning; yet it can be difficult to navigate this wealth of resources. Sue VanHattum has carefully collected and arranged some of the best of this writing. Imagine having a cheerful, knowledgeable, caring, and patient native interpreter accompany you on a tour of a foreign land. That's Sue in the land of math. She and the authors collected here care deeply about welcoming everyone to the world of mathematics. Whether you play with math every day, or are struggling to believe that one can play with math, Playing With Math will provide inspiration, ideas and joy. As a homeschool mom who grew up hating math, I didn’t want to pass that attitude on to my children. I thought if I bought a textbook and relearned it, I would somehow learn to enjoy it. That didn’t seem to help. Then I read Playing With Math and discovered that math isn’t what you find in a textbook at all. It’s all around us, it’s beautiful, and most of all, it’s exciting! This book is a gem that I turn to again and again for fun and inspiration.